Learning can be considered an outcome associated with acquiring new competencies (Sicilia, 2005) and adding new knowledge. A competence is a way to put into practice some knowledge in a specific context. The process of competency acquisition starts from a need in this specific context. It may induce the search and the selection of relevant resources. Numerous resources may be used during e-learning, their access is a real problem. Different approaches may be adopted to exploit them. 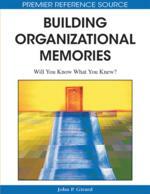 This chapter describes the tool E-MEMORAe, which supports an organizational goal-driven approach based on the concept of learning organizational memory. In such a memory, ontologies are used to define knowledge that indexes resources; the capitalization and the organization of knowledge, information, and resources relating to a specific context can be realized. End-users have a direct access to the memory. The organizational environment E-MEMORAe was evaluated in the context of two courses taught at the university (algorithms, mathematics). Learning can be considered an outcome associated with acquiring new competencies (Sicilia, 2005) and adding new knowledge. A competence is a way to put into practice some knowledge in a specific context. From an educational point of view, knowledge is defined as all the notions and the principles that a person acquires through study, observation, or experience, which can be integrated into skills. However, studying an encyclopaedia is not sufficient to get knowledge; Didactic work has to be made. The process of competency acquisition starts from a need in a given context. It may induce the search and the selection of relevant resources. Numerous learning resources may be used during e-learning. E-learning becomes part of a complex organizational conduct, in which lack of required competencies trigger the search for appropriate contents (Sicilia, 2005). Different approaches may be adopted to exploit such contents. They can be stored in learning objects repositories and then reused, combined and adapted in different contexts. They can also be selected and organized in learning memories that are directly accessed by learners. These approaches offer a goal-driven organizational learning. Over the last few years, many projects aiming at building bases of learning resources, in order to share and re-use them, have been launched. These projects often rely on a network of contributors that feed the base with collaboratively controlled resources. Conversely, each contributor can benefit from resources brought by other contributors. We can make a distinction between learning object repositories (LOR), which usually group many subject matters, and what we call “thematic resource bases” that contain resources related to only one domain. LOR usually group all subject matters. Their scope can be restricted to one or several universities or to a country; it can also be international. If expected scope is wide, LOR are based on a network of contributors or on a consortium of institutions. The restriction in resources related to a particular domain brings more homogeneity; resources and associated knowledge can be managed more precisely. Thus, relying on knowledge engineering techniques, Paquette (Paquette, 2001) designed knowledge and resources base on tele-learning. As in the case of repositories, the idea is also to share and re-use resources. These resources are not ready to be used by learners; instructional design work is usually needed beforehand.